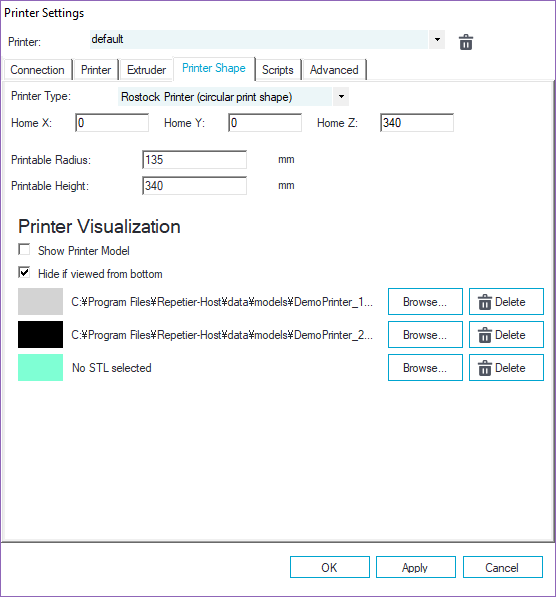 I don't have the drop down selections for selecting MAX/MIN X/Y/Z in my Printer Shape tab in the Printer Settings window. It was there on a previous version of Repetier Host (1.6.2), but when I upgraded my printer's firmware and moved to the newest version (2.0.5), I lost the drop downs. It's a nuisance to have to change my MAX Z Length in my firmware and in here every time I need to calibrate the head height. Any ideas on how to get the drop downs to appear? I can't find anything in the documentation about this. I'm running a large delta printer, similar to the Rostock v2 MAX, with a RUMBA board. These only appear for cartesian printers. For deltas radius and height define it. In next release host will again read reported position after homing overriding home z position.